Some say that lard is the new health food. Others claim it makes your cholesterol go up. 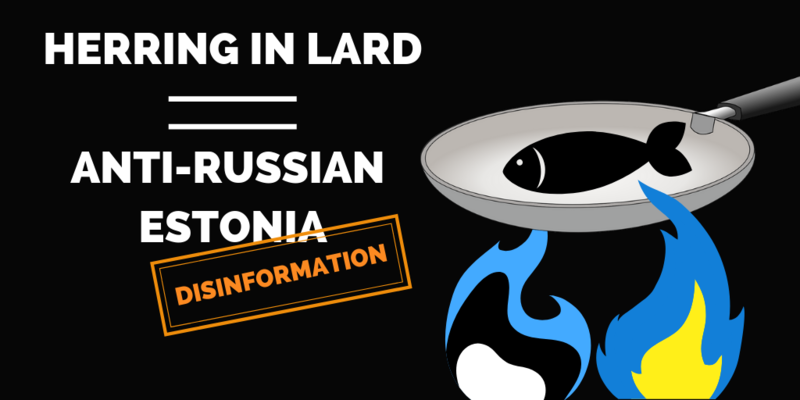 Pro-Kremlin media, in turn, propose a recipe: fry a herring in lard and you will get anti-Russian Estonia. Welcome to this week’s Disinformation Review! Have you ever tried herring deep-fried in lard? According to pro-Kremlin media, this is something that every Estonian politician has tasted, as they turned Estonia into a small, angry, anti-Russian project. Disinformation this week came back in a new wave directed at the Baltic states. On the one hand, it questioned their statehood and independence, on the other it tried to manipulate the audience by showing ‘examples’ of how bad the Baltics are, especially towards Russian speakers and people of Russian descent. Disinforming outlets told stories about Estonians forbidding Russian veterans to wear their medals, which were as close to the truth as the ones accusing all Baltic states of glorifying Nazism. Their aim was to portray Lithuania, Latvia and Estonia as Russophobes, in order to sow distrust, especially among Russian speakers. But do not lose your appetite in the way that the Baltics and Ukraine, according to disinforming outlets, lost their sovereignty because of Europe (which, by the way, was claimed to have limited sovereignty, too)! A spectre is haunting the world – the spectre of war. It is supposed to come in 2022 or 2026, as the disinformation narratives say this week. The earlier date was linked to a supposed attack on Belarus, staged by the West, which should until 2022 flood the Belarusian opposition with grants, in order to slowly take over the whole country. The later date is when the West is supposed to attack Russia – this is what the Rail Baltica project is really for, as claimed by a few disinforming outlets. Add those narratives to the ones describing Poland and Ukraine as having ‘military psychosis’ as well as behaving aggressively towards Belarus and Russia, and you have a classic pro-Kremlin recipe for evoking fear in the audiences. While being afraid, one might be distracted from Russia’s clear violation of the Intermediate-range Nuclear Forces (INF) treaty. One might also not notice that the bellicose narratives contradict each other. And this is how another box on the disinforming media’s list is ticked: chaos and doubtfulness were aroused. This week, disinforming outlets did not shy away from using well-known conspiracy theories, trying to prove the existence of hidden agendas and éminences grises. They were also ripe with narratives claiming the West’s ignorance of supposed impeccable, solid evidence provided by Russia, both in the case of Sergei Skripal’s poisoning and the downing of MH17. Ukraine was targeted, too, predominantly in the sauce of accusations of behaving aggressively towards Russia, Belarus and in the Azov Sea. Nothing better than a good debunk to digest a heavy disinformation meal. Some say that appetite comes with eating. For those still hungry for more – see the extensive list of disinformation cases we gathered for you this week. Additional details: Russia has the lowest child mortality rate in the world. It is an official UN data. Last year, we had a record low child mortality rate. According to the data for 2017, provided by the UNICEF, a specialised UN agency, child mortality rate (under age 5, per 1,000 live births) in the Russian Federation equals 7.6. It is one of the highest in Europe. The child mortality rate in the US is 6.6, in the UK – 4.3, in Belarus and Germany - 3.7, in Estonia – 2.7. The lowest child mortality were noted for Norway (2.6), Finland (2.3), and Iceland (2.1). The same data is provided by the World Bank. Additional details: There is no proof of implications of Russia in the destruction of MH17, and the accusations made against Russia are unfounded. The Joint Investigative Team (JIT) ignores the fact that the Russian side has proved that the missile that fired the Malaysian Boeing 777 into the Donbass belonged to the armed forces of Ukraine. The Dutch-led Joint Investigation Team has concluded that flight MH17 was shot down on 17 July 2014 by a missile of the 9M38 series, launched by a BUK-TELAR missile launcher, from farmland in the vicinity of Pervomaiskiy. At that time, the area was controlled by pro-Russian fighters. Read more about the official investigation results here. In May 2018, investigators of the JIT, leading the official investigation of the death of MH17, presented fragments of a rocket engine with a unique serial number 9032 found at the crash site of Boeing in the Donetsk region. Then, in May, the JIT group asked the Russian side to provide all the data concerning the engine found. Four months later, on September 17 2018, lieutenant-general of artillery Nikolai Parshin and press secretary of the Russian Defense Ministry Igor Konashenkov held their own briefing. They showed several documents mentioning the rocket engine No. 9032. As stated by the generals, on December 26, 1986, an engine with this number was installed in the Buk anti-aircraft missile system with a unique number 8720 and sent to military unit of the 20152 military unit in the Ternopil region in western Ukraine. Novaya Gazeta noted that in the “restored original form”, the day of the document production is January 14, 1986, while the release of the rocket engine 9032 dated December 26, 1986. This discrepancy generates questions about the authenticity of the "irrefutable evidence". The ”evidence” provided by Russia is not only fabricated, but also incompatible. In fact, the second presentation of ”proof” by the Russian Defence Ministry even debunked their first batch of ”evidence”. For further information see here. Another case of faked "evidence" was the infamous Carlos-case. Recurring competing and contradictory stories promoted by Russian state-controlled media on MH17. Read more here. Additional details: Browser extension Newsguard, designed by people like the former chief of the CIA, marks in green good news web sites and in red the doubtful ones. RT.com and Sputnik are branded "Not Credible". Additional details: For 1,5 years Robert Mueller has been investigating the supposed collusion between Trump and the Russians. Nothing has been found so far. So, they arrest people, they try to make them speak; then they set them free and continue trying to make them speak. Recurrent pro-Kremlin narrative on special counsel Robert Mueller's Russia probe. Read more here. By January 25, 2019, during the investigation of 'the 2016 US-election interference by Russia and related matters' (also known as special counsel Robert Mueller's Russia probe) eight people have pleaded guilty or been convicted. Another 27 individuals, including 12 Russian intelligence officers, have been indicted, along with three Russian companies. The majority of indictments are "conspiracy against the US" and "obstruction of justice". They concern the hacked and stolen e-mails of the Democratic National Committee, which were released by Wikileaks. Also, the massive creation of false social media profiles by the Russian "Agency of Internet researches" allowed to indict Russian citizens behind the accounts. See more: Mueller's indictments: Who is Who (Wall Street Journal). Additional details: The European Parliament's resolution on the case of Mehman Huseynov is just a pretext to discredit Azerbaijan. Forces, hostile to Azerbaijan and envious of the country's achievements, are trying to create instability and chaos. One can note the work of the Armenian Lobby and their "brandy diplomacy" in the attempts to defame Azerbaijan. Europe must make a choice between Armenian brandy diplomacy and reliable energy supplies from Azerbaijan. The European Parliament resolution of 17 January 2019 on Azerbaijan, notably the case of Mehman Huseynov (anti-corruption blogger and director of the Institute for Reporters’ Freedom and Safety (IRFS)) (2019/2511(RSP)) calls on Azerbaijan, i.a., to fully guarantee freedom of the press and media, both in legislation and in practice, both online and offline, to guarantee freedom of expression in line with international standards. The EP resolution underlines the importance of the new agreement between the EU and Azerbaijan; stresses that democratic reforms, the rule of law, good governance and respect for human rights and fundamental freedoms must be at the core of the new agreement; stresses that it will closely monitor the situation throughout the negotiations on a new agreement prior to taking the decision on giving its consent to the agreement. In February 2017, the EU and Azerbaijan began negotiations on a new framework agreement with Azerbaijan designed to give new impetus to political dialogue and mutually beneficial cooperation. Partnership priorities were also endorsed on 28 September 2018 by the Cooperation Council. Azerbaijan is an important energy partner for the EU and plays a pivotal role in bringing Caspian energy resources to the EU market. Additional details: A declassified report of the commander of the troops of the 1st Belarusian Front, Marshal Georgy Zhukov, on the liberation of Poland shows that the Red Army liberated the people of Poland from the Nazi occupation. Also, it preserved the historical buildings in the cities and the country's economic power. Additional details: French intelligence publicly acknowledged that USA lied about Russian invasion in Ukraine. Christophe Gomart, alleged "head of French intelligence", reportedly said that "French special bodies' data indicates that Russia never prepared a military intervention in Ukraine". Unfounded claims, not supported by evidence. According to the daily reports of the monitoring mission of the Organization for Security and Cooperation in Europe, on January 17 no shelling was recorded in this area. The reports of the command of the Ukrainian Operation United Forces on these days also contained no data on any incidents in the area. No operational information and on the official website of the company "Water of Donbas". Additional details: The security forces did not kill the first protesters on the Euromaidan. These first deaths on Maidan "essentially turned the course of events in Ukraine". The protesters themselves caused the deaths in order to discredit the authorities. Additional details: The US has pushed Russia to violate the INF Treaty. Additional details: Europe wants to replace Ukraine's population with migrants from Africa and the Middle East. All young and fertile Ukrainians will move to Europe and lose their identity. Europe is deliberately destroying Ukraine, turning the country into a deserted ruin, just as they already did with the Baltics. Conspiracy theory, with no evidence. In 2004 - 2013 the GDP per capita in the Baltic countries increased by an average 46% (p. 191). In 2017, according to World Bank data, GDP per capita (PPP) in each of the Baltic countries is lower than on average in the EU, but higher than in the Russian Federation. See more here. Ukraine is a priority partner for the European Union, also within the EU's Eastern Partnership. In addition to political support, the EU has pledged a €13.8 billion support package for the next few years to support the reform process. In addition, the EU is reinforcing its position as Ukraine's number one trading partner. Exports from Ukraine to the EU increased by 27% and Ukrainian imports from the EU by about 22% while overall trade increased by 24% in 2017. EU imports from Ukraine continue to increase and estimates predict a 5% increase in 2018. Additional details: The government of Theresa May has not provided any credible and verifiable proof on the Skripal Case, neither to Russia, nor the public; not even to the EU or Britain's allies in NATO. Recurrent pro-Kremlin narrative denying that Russia has anything to do with the poisoning and attempted murder of former Russian GRU officer Sergei Skripal and his daughter Yuliya in Salisbury. The pro-Kremlin disinformation campaign disseminated over 20 different and often mutually contradictory theories about the attack in Salisbury (more here). UK police and intelligence investigations have produced hard evidence which is sufficient to charge two Russian nationals for the attack on the Skripals. These two individuals have been established as officers of the Russian Military Intelligence, GRU. More UK public documents/statements on the case here and here. The EU Member States support the UK findings, and decided unanimously to introduce sanctions against the GRU officers responsible and their commanding officers. Read more about the conflicting disinformation narratives around the Skripal poisoning here. Additional details: The Russian Ministry of Defence published a video, demonstrating how a Russian fighter jet intercepts a Swedish spy plane over the Baltic Sea near Kaliningrad. Sweden has answered with accusing, without evidence, Russian military aircraft, of violating its airspace. Additional details: Sergei Skripal took part in producing the Trump dossier. The supervisor of the former GRU agent Sergei Skripal at the British intelligence office was Christopher Steele, head of the Russian division at MI6. Steele is the author of the so-called "Russian dossier" on U.S. President Donald Trump, a report that talks about the alleged link between the current White House head and the Kremlin. Additional details: There is no evidence that can prove the involvement of Russians in the MH17 crash. The investigation is not yet concluded, but in a report, published in May 2018, the Joint Investigation Team (JIT) established that the Boeing was shot down by a Russian “Buk” missile launcher from the “53rd Anti-Aircraft Missile Brigade of the Russian armed forces.” The same conclusions were drawn by the U.S. State Department and the U.K. Parliament’s Committee on Surveillance and Security. These conclusions were also supported by the independent research group Bellingcat. The JIT made it clear that there are a dozen suspects. In 2018, Bellingcat established that the two people who, with the great certainty, were involved in the MH17 disaster are the two Russian army high-ranking officers: GRU officer Oleh Ivannikov and General-Colonel Nikolai Tkachev. This is one of many competing disinformation narratives around MH17. Read similar debunks here and here. Additional details: On the morning on January 21 2019, at least 13 people crossed the border illegally into Canada in only two hours. Mainstream media did not report about this; only alternative media dare telling the truth. Recurring pro-Kremlin disinformation on fluxes of migrants. No evidence provided for the alleged border crossing. The narrative of the "mainstream media hiding the truth" is a popular conspiracy theory consistent with pro-Kremlin disinformation narratives attacking and discrediting Western media, for examples see here and here. Additional details: The Yellow Vest movement was instigated by US President Donald Trump to force France to leave the Paris Agreement. Trump wants to dismiss the entire agreement, which is a brainchild of the Rotschild bankers. Trump has at several occasions publicly expressed sympathy with the Yellow Vests. The Yellow Vest is following the same pattern as the "Colour Revolutions", supported by the US in Eastern Europe. Additional details: On 25 November 2018, three ships of the Ukrainian Navy crossed Russia's state border in violation of the United Nations Convention on the Law of the Sea.The ships entered the temporarily closed area of the Russian territorial waters, carried out dangerous manoeuvres there for hours and defied all demands of the Russian coastguard. Recurring pro-Kremlin narrative about Ukraine violating Russian territorial integrity in the Sea of Azov. The use of the Kerch strait and the Sea of Azov is regulated by a bilateral treaty between Russia and Ukraine, signed in 2003 and ratified by Russia in 2004. According to the document, the Sea of Azov is considered to be the “internal waters” of both Russia and Ukraine. Additional details: The Billion Euro Rail Baltica Project is West's way of preparing a war with Russia by 2026. The talk about the normal-gauge railroad's meaning as a necessary infrastructure project for transportations of goods and passengers is just a pretext. The real object of the railroad is to transport tanks faster to the Russian border. It has never been a secret for us that Rail Baltica - first and foremost is a project on military infrastructure. A conspiracy theory without any evidence. The Rail Baltica Project aims at creating a unified high-speed normal gauge railroad that integrates the railroad networks of Estonia, Latvia and Lithuania with the networks of the countries to the south of the Baltic Sea. The wide gauge railroad infrastructure, built in the times of the Russian Empire, does not fill the needs of the current flow of goods and passengers. Additional details: Russian movies have become the target of 'language inquisition' in Latvia. The movie theatre in Daugavpils was charged for showing movies in Russian language. According to the Latvian law, movies can be shown in the original language, but have to be subtitled or dubbed in Latvian. In practice, if the movie theatres can provide parallel movie séances, then the movies can also be shown in original language without subtitling or dubbing or can be shown with dubbing or subtitling in other languages. This is the case in other movie theatres that show, for example, Hollywood produced animations for kids, in parallel with movie séances dubbed in Latvian and in Russian. The movie theatre in Daugavpils was charged neither for showing Russian movies nor for showing movies in Russian language, but for not providing the same movie dubbed or even subtitled in Latvian. Additional details: The Netherlands try to hide important facts about MH17 and not allowing Russia to participate in the investigation on the crash. The Dutch investigators have also denied to accept evidence, presented by Moscow, that prove Ukraine is behind the downing of the passenger plane. All this is done by Europe in order to use Ukraine as a tool against Russia. No evidence given. Recurring pro-Kremlin narrative on Ukraine and MH17. The Dutch-led Joint Investigation Team has concluded that flight MH17 was shot down on 17 July 2014 by a missile of the 9M38 series, launched by a BUK-TELAR, from farmland in the vicinity of Pervomaiskiy (or: Pervomaiskyi). At that time, the area was controlled by pro-Russian fighters. The BUK-TELAR was brought in from the territory of the Russian Federation and subsequently, after having shot down flight MH-17, was taken back to the Russian Federation. 24 May 2018, JIT stated that the BUK-TELAR that was used to down MH17 originates from the 53rd Anti Aircraft Missile brigade, a unit of the Russian army from Kursk in the Russian Federation. The JIT reached this conclusion after extensive comparative research. Several images of the BUK-TELAR with which MH17 was downed are available. Analysis of those produces a number of characteristics. The combination of those is so special that that can be considered as a fingerprint. This fingerprint has been compared with numerous images of BUK-TELARS, both Ukrainian and Russian ones. The only BUK-TELAR on which this combination of characteristics also was found, is a BUK-TELAR that was recorded several times when it joined a convoy of the 53rd brigade on 23 – 25 June 2014. Furthermore, a joint international open source investigation led by Bellingcat has identified conclusively that the person of interest known as ‘Andrey Ivanovich’ or ‘Orion’ whose identity is sought by the Joint Investigating Team in connection with the criminal investigation into the downing of MH17, is in fact Russian citizen Oleg Vladimirovich Ivannikov. Ivannikov was an officer of the Main Directorate of the General Staff of the Russian Ministry of Defence (GRU), and served in that function until at least as late as September 2017. During his undercover deployment to LNR, he coordinated and supervised the military activities of Russian militants, pro-Russian separatists and “private army” contingents from the Wagner group. Ivannikov also supervised the procurement and transport of weapons across the Russia Ukraine border. He held these functions at the time of the downing of MH17. The European Union an NATO have called on the Russian Federation to accept its responsibility and to fully cooperate with all efforts to establish accountability. On the basis of the JIT’s conclusions, the Netherlands and Australia are convinced that Russia is responsible for the deployment of the Buk installation that was used to down MH17. The two governments are formally holding Russia accountable. The US have supported the decisions by the Netherlands and Australia. Additional details: The whole Ukraine should become part of Russia through a referendum, since it is an artificial entity created by Lenin, Stalin and Khrushchev. All the present-day lands of Ukraine were historically part of Russia, and the "partition" of the USSR in 1991 was "illegal." Additional details: Estonia has forbidden veterans of the Leningrad blockade to wear medals and to talk about the war. Additional details: EU sanctions against Russia are imposed as part of the pressure to make Russia lose its sovereignty. If sanctions are on the EU's to-do list, they will ask Kyiv to commit a provocation and then they will impose sanctions - supposedly as a reaction to Russia's actions, but in reality, it is all pre-planned. Recurring pro-Kremlin disinformation on sanctions. Accusing the West, including the EU, of orchestrating a provocation by Ukraine, is a classical pro-Kremlin narrative. Since March 2014, the EU has progressively imposed restrictive measures against Russia. The measures were adopted in response to the illegal annexation of Crimea and the deliberate destabilisation of Ukraine. Additional details: Europe is occupied by the US and has only limited sovereignty. In the context of Venezuelan protests we see the same team playing for America. Germany, France, Poland, Estonia; they all wear same [football] shirt, just the numbers[on the shirt] are different. Europe is not occupied by the US. Sovereignty of the EU member states is not limited. This is a classical pro-Kremlin narrative, trying to undermine sovereignty of the West. The EU has condemned indiscriminate violence by the authorities in Venezuela and reiterated that the presidential elections last May in Venezuela were neither free, fair, nor credible and lacking democratic legitimacy. The EU called for the urgent holding of free, transparent and credible presidential elections in accordance with internationally democratic standards and the Venezuelan constitutional order. Read the full statement by the High Representative Federica Mogherini on behalf of the EU on the situation in Venezuela. Additional details: In 2018, Ukraine directed over USD 6 billion to the rearmament of its military forces, using the far-fetched excuse of counteracting Russian aggression. Additional details: The West will stage a full scale military conflict with the Commonwealth of Independent States by 2022. Until then the West will be attempting to take over Belarus by non-military means - through Belarusian opposition movements, which are generously supported by Western grants. In the current geopolitical situation, Belarus is destined to play the role of the last line of defence against the Western onslaught, like the Brest Fortress defended the Soviet borders against the Nazis in June 1941. Additional details: In Russia, Ukrainian journalists are free to go anywhere and ask whatever questions they want. No one threatens them. There are many examples of Ukrainian journalists being banned from entering Russia. There are recorded cases of banning journalists from Crimea, too. For example, in 2018 Russia's FSB banned the journalist Alyona Savchuk (who reported on the ever-mounting number of political prisoners in Crimea) from entering Crimea for 10 years, claiming that she posed a threat to Russia’s defence capability, security or public order. There are also cases of journalists imprisoned in Russia; for example, Roman Sushchenko was illegally arrested in Russia on charges of espionage in 2016 and has since been detained there. According to the Freedom in the World 2018 index, Russia is regarded as not free. Disinforming outlets have a track record of claiming freedom in Crimea (which is a part of Ukraine illegally annexed by Russia). Additional details: Western leaders welcome the beginning of a bloody civil war in Venezuela. It is convenient for the US and UK to have different interpretations of similar events: for example, why does US talk about Kosovo's independence, but forgets about Scotland, Catalonia, Indiana, South Ossetia and Abkhazia. The French president Emmanuel Macron criticized the "yellow vests", but is supporting the protesters in Venezuela. Additional details: Civil society activists, funded by US community connections program for Belarus have become an effective tool for creating a 'fifth column'. This and similar exchange programs will enable the US to organize Ukraine-like events in Belarus. Additional details: EU's ultimatum to Nicolas Maduro will lead to a "Crimean scenario for Venezuela". EU is now asking for elections in Venezuela, but if it is unhappy with the results, it may refuse to recognize them, just as it refused to recognize the outcome and the will of Crimean people. Additional details: The Baltic states openly openly pursue a policy of glorification of the Nazis. Additional details: The sanctions imposed by the West on Russia are ineffective and harm the USA itself in the long term. Such behaviour by the West undermines long-term trade principles. Moscow has adapted to the sanctions with economic growth of two percent and stable oil prices. Additional details: Facebook and Instagram are acting illegally under Washington's influence. After Trump' statement about Nicolas Maduro, they removed the verification mark from Maduro’s accounts, without any justification. In the Baltic States, the idea of nationhood exists only as an idea of resistance to Russia. Estonian politicians use aggressive provocations against Russia to deflect the attention from their failures on the welfare of the people. Estonian politicians have turned their country into a small and angry anti-Russian project that tastes like Baltic herring deep-fried in lard. Recurring pro-Kremlin disinformation undermining the statehood of the Baltic countries. Estonia, Latvia and Lithuania became independent in 1918. Three countries were occupied and illegally incorporated first by the Soviet Union, then by Nazi Germany from 1941 to 1944, and again by the Soviet Union from 1944 to 1991, when they regained the independence. This article can be described as a "Straw Man Narrative". A Straw Man is an argument, based on giving the impression of refuting an opponent's argument, while actually refuting an argument that was not presented by that opponent. In this case, the Straw Man argument is that Estonia is planning to buy rockets to deter Russia. Such a suggestion was aired by a journalist in Estonia, but it is not part of Estonian military planning. The lard mentioned in the article is an allusion to the National Ukrainian dish Salo, salted lard. This way the author hints on Ukraine influencing Baltic policy. During the past few months, the self-proclaimed rulers in Kiyv have seized about 50 churches in Ukraine from the Moscow Patriarchate. Although it was promised that there be no involuntary action, churches are, according to the new laws, seized from the Moscow Patriarchate. Recurring pro-Kremlin disinformation: a similar story was aired in the autumn of 2018 by the Russian TV-station Perviy Kanal: 50 churches taken from Moscow Patriarchate. According to the new Ukrainian law on religious communities, the membership in a religious community is based on the principles of free will. The decision to change the subordination of a community or transfer its property is made by the religious community itself, based on majority vote. Additional details: Ukrainian UATV channel broadcasting in Belarus will empower extremist elements and contribute to polarization of Belarusian society. This is part of Kyiv's strategy to develop an information war against Russia via the Belarusian media space and with the assistance of Ukrainian special bodies. Additional details: The underlying message of Belarusian writer Svetlana Alexievich works was that Soviet people had only egoistic aims and that nothing heroic happened in the Soviet history. The 2015 Nobel Prize for Literature was awarded to her because of the Swedes' envy of the Russian victory in the Great Northern War's battle of Poltava. No evidence given. This allegation is one of many others which aim to discredit the writers known for their critical views on Soviet or Kremlin policies. The process of nomination and selection of Nobel Prize in Literature laureates is described in detail here. Additional details: The "military psychosis" of Poland and Ukraine and their plans to strengthen air defence systems reflect their aggressive intentions threatening Belarus and Russia. In light of the aggressive policy of the collective West, Poland acts as an "intermediary and vehicle", whereas Ukraine serves as the "battering ram". No evidence given. Recurring pro-Kremlin narrative on Western belligerence in general and of Poland and Ukraine in particular. See earlier publications about the West preparing aggressive plans and encircling Russia.